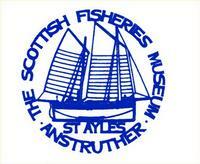 The Scottish Fisheries Museum is situated in Anstruther, in the old Kingdom of Fife, overlooking the ancient fishing harbour. It is at the heart of the East Neuk fishing villages of St Monans, Pittenweem, Cellardyke and Crail, the centre of local crab and lobster fishing. The Museum researches and tells the story of the Scottish fishing industry and its people from the earliest times to the present. The comprehensive Collection includes ships, models, paintings, photographs, equipment and the written word. The Museum, occupying 27,600 sq ft, is housed in a group of attractive buildings of historic and architectural interest, set around three sides of a cobbled courtyard. They include an 18th century merchant's dwelling, a mid-19th century store-house on the foundations of the mediaeval chapel of St Ayles and also the 16th century Abbot's Lodging. There is a small and private chapel at the museum, which commemorates all those Scots who lost their lives at sea while fishing. The Museum's flagship, REAPER, a 104 yr old fishing fifie visited 12 British ports in 2005, including Portsmouth for the Festival of the Sea and hosted some 20,000 visitors. From Junction 3 on the M90 follow the A92 to Kirkcaldy. Take the A915 through Leven, as far as Upper Largo, then the A917 through the East Neuk fishing towns of St. Monans and Pittenweem to Anstruther.